Upgrade your spring wardrobe with this twist on a windowpane. Featuring a micro-windowpane in seasonal colors, this mid-weight twill may seem ordinary at first. Take a second look and you’ll find slubbed threads that make up the warp and weft - each a different color. The unique blue warp and green weft create a subtle visual texture in this perfect warm weather style. 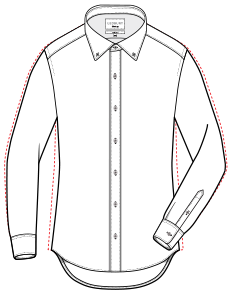 Finished with a Ledbury Spread collar and a standard body length. Available in classic and tailored fit.